Interabang's book buyers look for releases that push boundaries and break down walls between communities and languages. 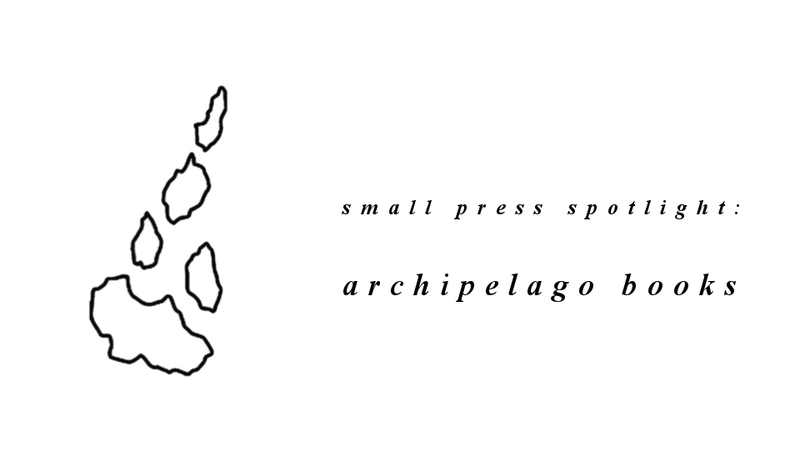 One small press that seems to specialize in this type of literature is Archipelago Books of Brooklyn, NY. Every year they release new and classic works in translation, opening a window to a world of literature outside our preconceived notions of narrative and voice. Check out these titles from our Archipelago Books spotlight table, and visit the store to check out the rest of our selection! If you're looking for an immersive reading experience for the second half of summer, look no further than Karl Knausgaard's (Sweden) MY STRUGGLE. This is the first in an epic pseudo-biography series, detailing Knausgaard's life from childhood through early adulthood. Vol. 1 will knock your socks off with its perception and intimacy. I've never read any other writer in prose or poetry who details thought and memory so extensively and precisely. When Knausgaard recalls, he does more than remember-- he recreates. Of these five books, Pierre Michon's (France) SMALL LIVES is the most precarious. Characters are always shifting from place to place, and the narrative's speakers swim from image to thought to memory without clear transition. There's also no defined dialogue-- conversations instead take place within the body of a paragraph as description. Here's why these formal techniques are so important: SMALL LIVES is a novel about writing and language itself. By following the thoughts and actions of its ensemble cast of everyday thinkers and artists, Michon tries to show us the gap between language and the objects and realities it's meant to depict. Michon's novel thrives in the able hands of translators Elizabeth Deshays and Jody Gladding. What does writer Mircea Cărtărescu (Romania) want to show us about the interior of a dream? Heck if I know. BLINDING is a whirlwind, an explosion, a Technicolor nightmare of a story. In a broad sense the book is about a man's experience in the underbelly of Bucharest, slipping from alleyway to apartment window to cellar cantina. What most of us will remember from BLINDING is its incredibly unique pastel of images, and how they come in and out of view like streetlamps on a darkened boulevard. BLINDING is what the Beat Generation aspired to accomplish-- an imagistic dreamscape novel which usurps expectations at every turn. Little did they know that Cărtărescu did just that behind the Iron Curtain. Oh, and translator Sean Cotter, teaches at the University of Texas- Dallas. No big deal. (Very big deal). Tarjei Vesaas (Norway) is one of the most important writers of the 20th Century most of us have never heard of. In THE BIRDS, Vesaas gives us a family drama against the backdrop of economic and social insecurity a la Shepard or Fitzgerald. And here Vesaas fixates on the image of a watchful bird as a way of grounding the story with a constant motif, much like mid-century writers of Central America might orient a story around a papaya tree. It's rare to read a certifiably great novel-- THE BIRDS is great. Archipelago has (thankfully) joined in the recent movement of new translations of Rainer Maria Rilke's (Austria-Hungary) writings. For the uniniated: Rilke is perhaps the greatest German-language poet ever. Even readers of Rilke generally don't know of the poet's friendship with legendary artist and sculptor Auguste Rodin. These two essays on Rodin's art give us remarkable insight into Rilke's changing aesthetic values as he was exposed both to the mastery of Rodin and the vibrance of Modernism in turn-of-the-century Paris. Here's the jist: "The natural object is always the adequate symbol." Ezra Pound's famous dictum of modernist imagism is captured decades before in the powerful reflections of Rainer Rilke in AUGUSTE RODIN. This is a great read for anyone interested in questions of art, poetics, and beauty.